For many Americans, mid-summer is best spent by the shore; beaches and lakes are traditionally packed this time of year. And if you’re lucky, that little time by the water will involve a glimpse at some aquatic life — a sand crab, a sea star, perhaps a fish or two. 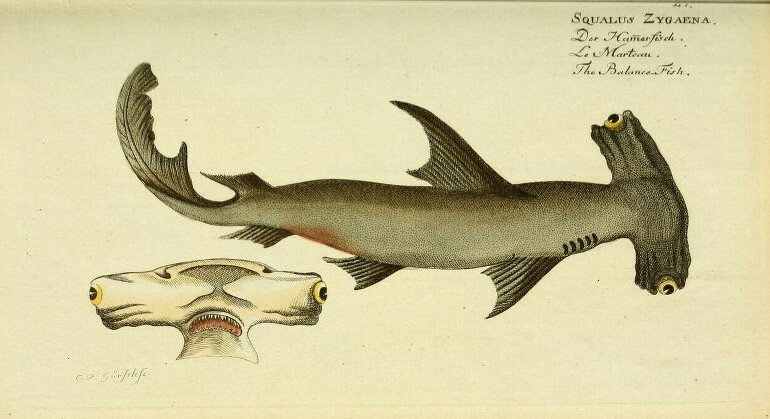 If your summer sightings have inspired an interest in fish (or perhaps you want to save yourself the sunscreen and view some wildlife from the comfort of your computer screen), one of our favorite sources of undersea imagery is the ichthyology work of Marcus Elieser Bloch (1723-1799). 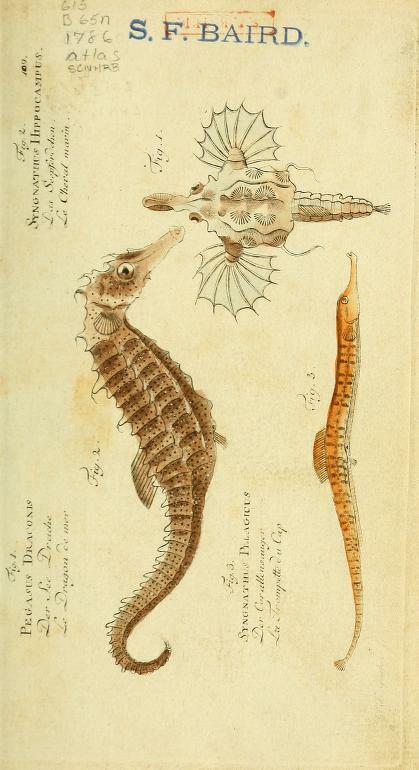 Seahorses from Bloch’s Allgemeine Naturgeschichte der Fische (1782-1795). 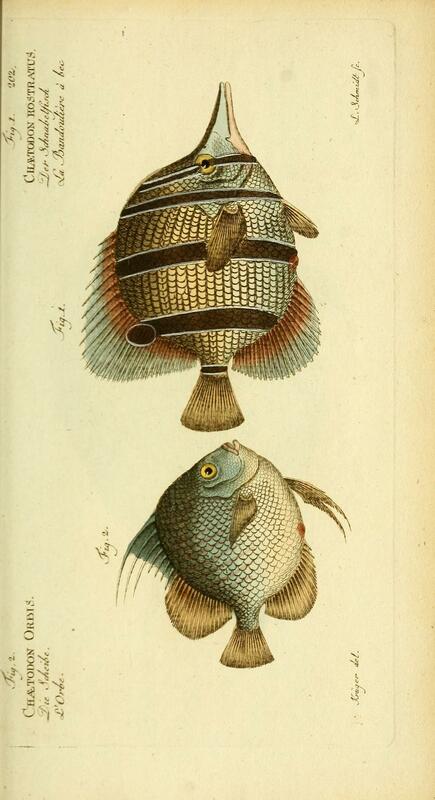 Allgemeine Naturgeschichte der Fische (General Natural History of Fishes) was published in Berlin between 1782 and 1795 by the author himself and his bookseller, Hr. Hesse. Though Bloch became a notable expert on fish, he began his career first as a teacher and then as a physician. 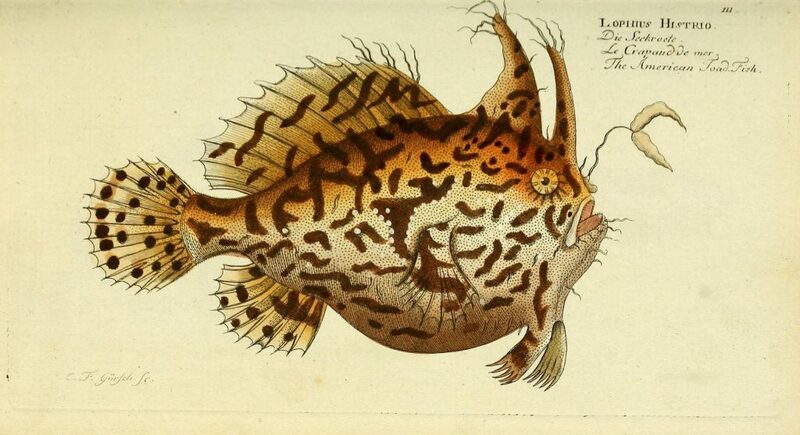 He wrote numerous medical papers and studied fish in his spare time, accumulating his own collection of specimens. 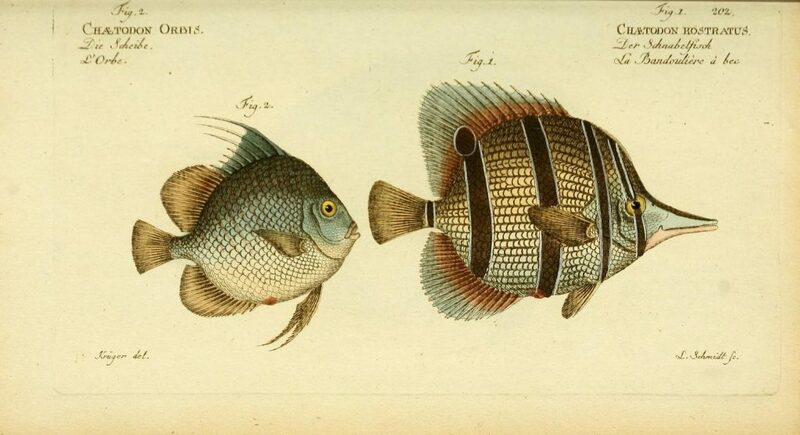 Round Spadefish and Butterfly Fish from Bloch’s Allgemeine Naturgeschichte der Fische (1782-1795). 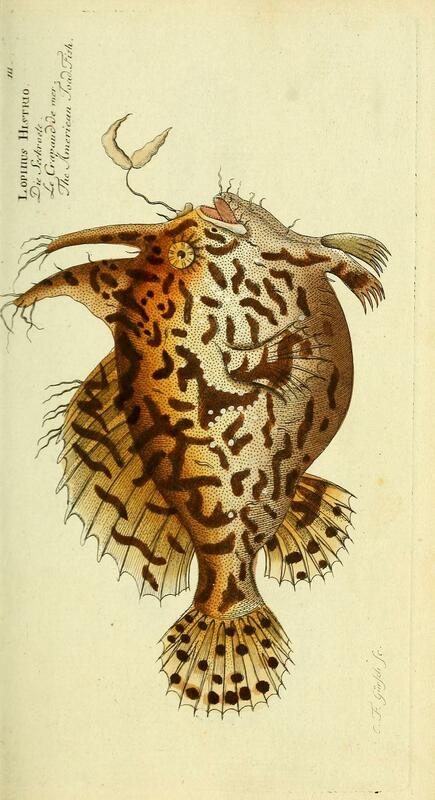 Frogfish from Bloch’s Allgemeine Naturgeschichte der Fische (1782-1795). Bloch’s work is impressive not just for its gorgeous plates but also because of the important taxonomic information it contains. He was the first to name and describe many of the species featured in the book and it remains an important reference for researchers today. Even before the first printing was complete, a second, in French, began so that the tome could reach a wider audience. For each set, engravers worked over a 12-year period to meticulously reproduce the illustrations. 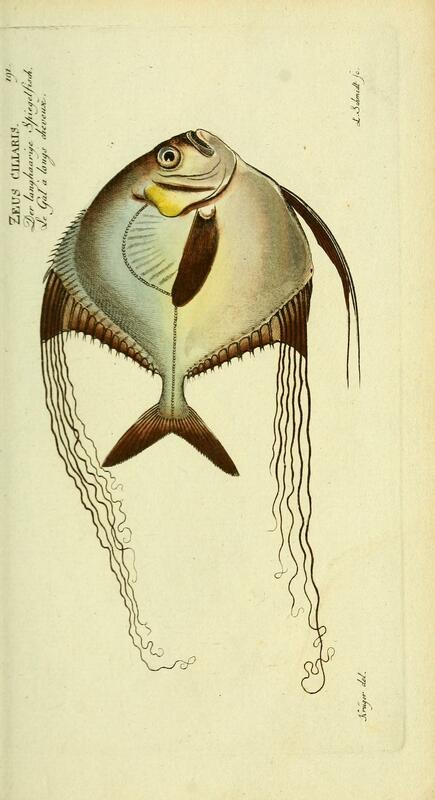 African Pompano from Bloch’s Allgemeine Naturgeschichte der Fische (1782-1795). The Smithsonian is one of only nine institutions in the world to hold a complete set of the original German editions and one of only two libraries to hold both the German and the French. The books are housed in the Joseph F. Cullman 3rd Library of Natural History, the Smithsonian Libraries natural history rare book collection. Bloch’s Allgemeine Naturgeschichte der Fische, including multiple volumes of text volumes and the second atlas of plates featured here, has been digitized and is available in the Biodiversity Heritage Library for your viewing pleasure. 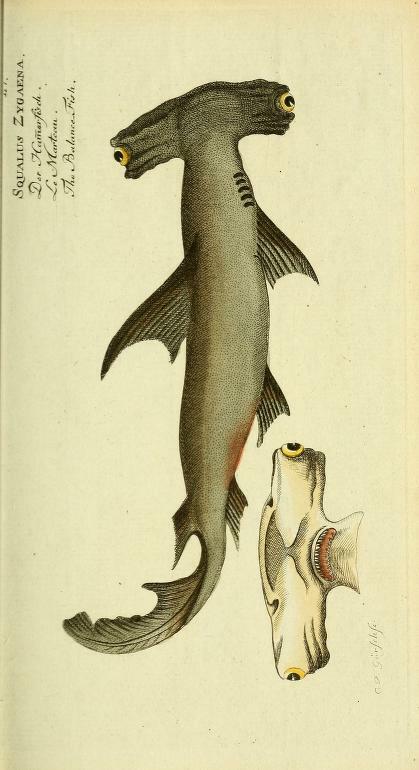 Smooth hammerhead from Bloch’s Allgemeine Naturgeschichte der Fische (1782-1795). Hans-Joachim Paepke. Bloch’s fish collection in the Museum für Naturkunde der Humboldt-Universität zu Berlin : an illustrated catalog and historical account. Ruggell, Liechtenstein : A.R.G. Gantner ; Königstein, Germany : Distributed by Koeltz Scientific Books, 1999. University of Reading Special Collections Services. 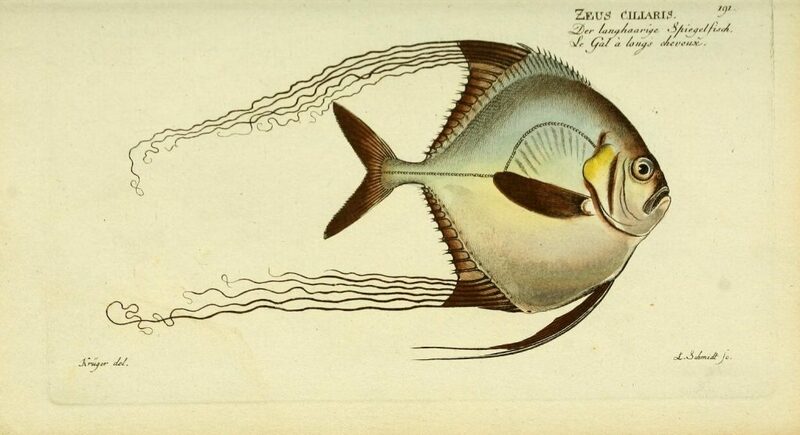 “Ichthyologie ; ou Histoire Naturelle des Poissons.” http://www.reading.ac.uk/web/FILES/special-collections/featurebloch.pdf. 2011. Accessed July 2015.